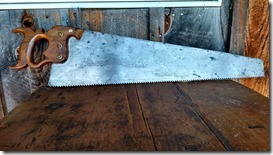 After finding this Walter Cresson hand saw in an antique shop in Palmer MA, I went looking for some information on it. For a saw this old, it is in remarkable shape. I immediately knew it had some special. 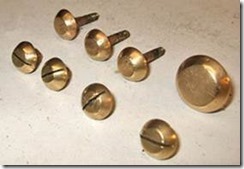 Wiktor Kuc of http://wkfinetools.com had the information I was looking for, and its included below. This is now the oldest saw I own, and certainly in the best shape of anything I’ve found any where’s near this old. I’m going to chalk it up to a well spent $5! Several other writers and historians of the era also mention Walter Cresson, a sawmaker. Among them are Edwin T. Freedley, J. Leander Bishop, J. Thomas Scharf and Thompson Westcott, William J. Buck, and R. A. Smith. All of them however, supplied only a few words confirming that such sawmaker existed. Contemporary writings are limited to short notes in The Directory of American Toolmakers (EAIA, 1999) and listing in the Hand-saw Makers of North America (Schaffer, 1999). This sketchy picture was a motivation for ongoing research and a summary of my findings are presented here. The document provides testimony of Walter Cresson, Ann R. Cresson, a widow and “administratrix” of the estate of William Cresson, and report of court appointed master for reexamination of the facts. Based on those findings, we can establish a time frame for saw manufacturing business, partnership arrangement between brothers, and how business and finances were managed. The document also shows date of business dissolution and sale to Henry Disston, describes proceeds received from sale and investment in new business venture. I used this document as most reliable basis for a timeline to compile this review. Walter Cresson was born in Philadelphia, March 11, 1815. 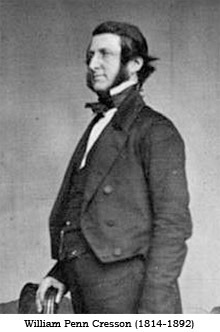 His parents, John Head and Rachel (Walter) Cresson, were members of the Society of Friends, and in the doctrines of that faith he was carefully educated and trained. About the year 1842, however, he joined the Protestant Episcopal Church, in which he was for many years an earnest and faithful worker. 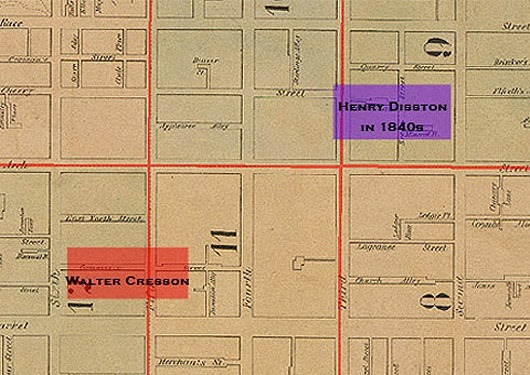 In 1837 William Cresson, the older of two brothers, had a merchant business on 14 N 14th Street. At that time Walter did not appear in the M‘Elroy’s Philadelphia Directory for 1837. William and Walter lived with their father John H. Cresson at 314 N 6th Street. The father held a position of secretary and treasurer at Mine Hill and Schuylkill Haven Railroad Company. Sometime before 1839 Walter joined William and they worked together as merchants with their business located at 14 N 14th Street. It appears that there were no changes in the business for several years. The directory listings for business location are all the same through 1839 – 1841 period. In 1842 small change appeared in the M‘Elroy’s Philadelphia Directory. In addition to separate listings, combined listing was also placed. Now they appear as Cresson William & Walter, merchants, at 14 N 4th Street. I am not sure of the meaning of this change. It is possible that they became formal partners a year before. Very little is known about the type of mercantile business they conducted. I was able to find one advertisement in Sheldon & Co’s Business or Advertising Directory – New York, Boston, Philadelphia, &c. for 1845, (New York, 1845) that gives a bit of information. From this ad it looks like they were involved in high quality household goods, imported from England, possibly France and Germany and other countries. Without examination of their business records, it is impossible to determine if Cressons were direct importers or buying their inventory from wholesalers. 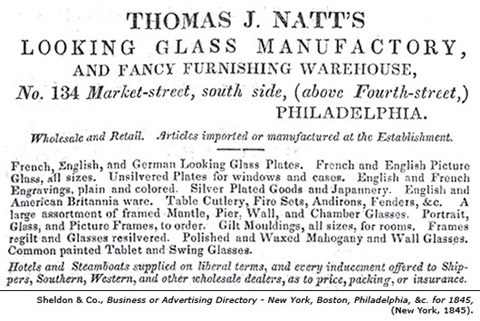 Below are some sample advertisements of importers and wholesalers doing business in Philadelphia in 1845. Even this small example shows that import and wholesale industry was prospering in Philadelphia. Other cities like New York, Boston, and Baltimore were also well capable to supply full array of imported products to the market. The 1844 McElroy’s Philadelphia Directory did not register any unusual changes. William & Walter Cresson continued their mercantile business at 14 N 4th Street. 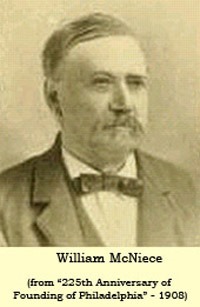 William P. Cresson (1814-1892), seen in the listing above was a merchant and hardware manufacturer, involved in production of wide variety iron articles including stoves and construction hardware. Apparently a stove making was his strong focus. Between 1846 and 1850, in association with others, W. P. Cresson received ten different patents for stoves design. In a few years Walter Cresson and William P. Cresson will cross their business paths. The Business Directory section for 1844, published for the first time in McElroy directories, listed four active saw manufacturers. This listing should not mislead the reader. It only means that four saw manufacturers decided to pay for the listing. The business directory listings was equally available to everyone, but it was fee-based and usually only small number participated in this type of advertisement. 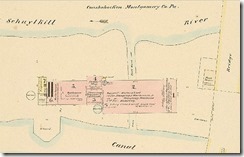 In reality, Philadelphia of 1844 was fertile city for the sawmaking business. 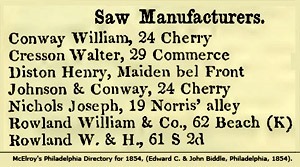 The directory lists about 20 men involved in sawmaking, saw repair and maintenance. Among them are names like Rowland, Johnson, Disston, Paul, Turner, Nichols, and other, lesser known startup operators. It is also possible that some were employees of Henry Disston. Brearly, James – saw maker, 3 Fries’ Ct.
Difer, William – saw maker, 34 Sugar al. In May of 1844 Walter married Alice Hannum and they moved to 83 Marshall Street as shown in 1845 McElroy’s Philadelphia Directory. William continued residence with his father on 314 N 6th Street. Cresson brothers appear again as merchants, working at 14 N 4th Street. In the business listing for Saw Manufacturers brothers did not appear. However, we can find some familiar names here. 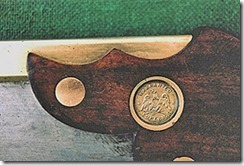 William Rowland was already a very well known saw manufacturer with reputation to be the best in the business. Henry Disston is listed for the first time, together with a few smaller saw producers. All of them cross their paths at some point. 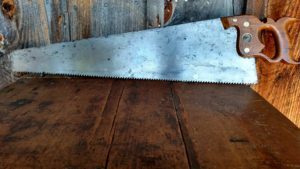 Charles Johnson was a Disston’s teacher, William Toland partnered with Disston for short period, and Jonathan Paul and Turner Brothers hammered their saws for years despite competitive pressures. These were the names that shaped the landscape of this rapidly developing industry. 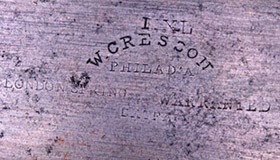 In the 1846 McElroy’s Philadelphia Directory Walter and William are listed at the same location as previously but the listing for William P. Cresson changed. He appeared as the owner of iron foundry on James Street. As we can see in the next year’s listing, Cresson brothers moved their business to the 18 Commerce Street, previous occupied by William P. Cresson. It is interesting to note that since the beginning of their business, both brothers used “merchants” in their description. I was anticipating that they would change this description with a move to their new locations. 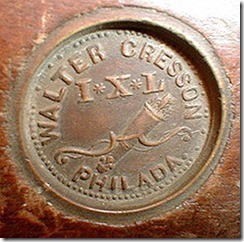 This did not happen and it took almost 10 more years to see a listing for Walter Cresson – Saw Manufacturer. 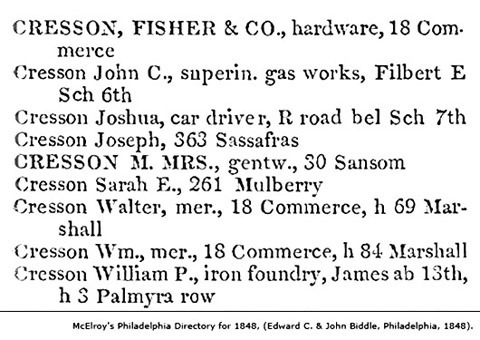 The 1847 McElroy’s Philadelphia Directory shows a new location for Cresson brothers at 18 Commerce Street. Unfortunately, the Business Directory section was not included in this edition. It appears that 1848 was a year to try a new business association for Walter and William. Additional entity is listed at the location of their business – Cresson, Fisher & Co., Hardware Commission Merchants. First mention of Cresson, Fisher & Co. appears in the Journal of the Franklin Institute of the State of Pennsylvania, Vol. 11, (Philadelphia, 1846). 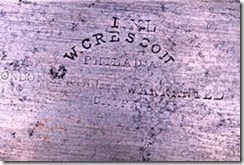 In the report for the Sixteenth Exhibition of American Manufactures, held in the city of Philadelphia, from the 20th to the 31st of October, inclusive, 1846, by the Franklin Institute of the Stale of Pennsylvania, for the promotion of the Mechanic Arts one of the recipients of the award was Paul & Hicks, represented by Cresson, Fisher & Co. This is all I know about Cresson, Fisher & Co. and any attempt to locate more information was unsuccessful. The clipping below fills this picture a bit more. 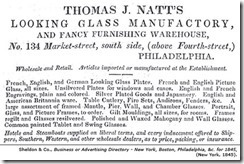 The advertisement was placed by Cresson, Fisher & Co. in the Philadelphia Almanac and General Business Directory for the year 1848. In it they declare to be an Agent for Walter Cresson and William P. Cresson. 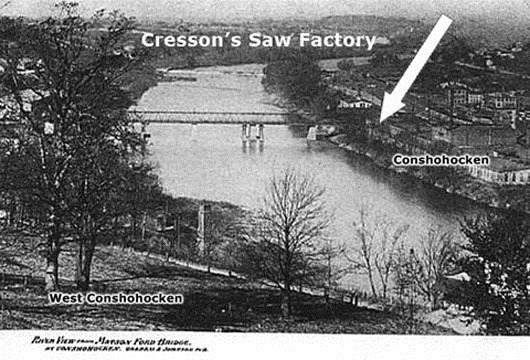 This advertisement is also first documented statement about Cresson making saws. 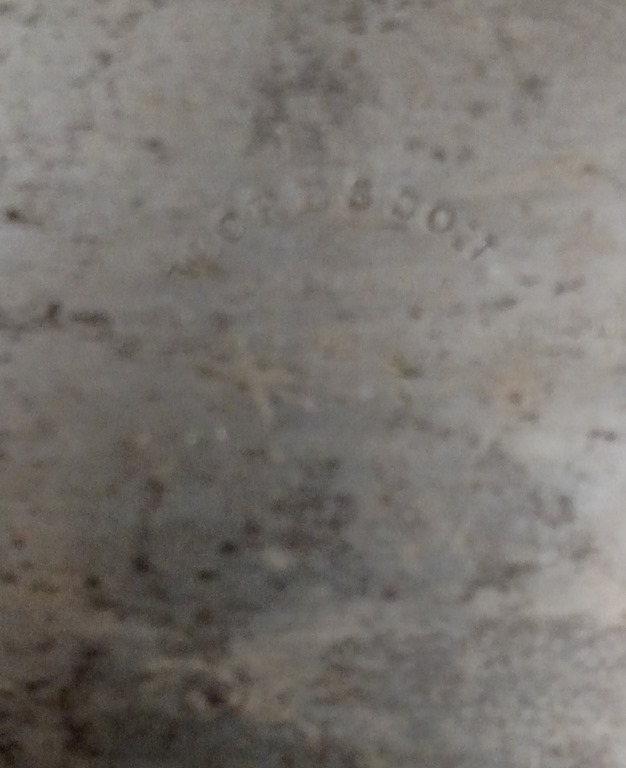 It is likely that Cresson, Fisher & Co. was a sales arm of William P. Cresson and Cresson brothers participated in this arrangement. Cresson, Fisher & Co. was promoting and selling their saws as well as products manufactured by William P. Cresson. Walter and William are not listed in the Saw Manufacturers section of this Almanac. 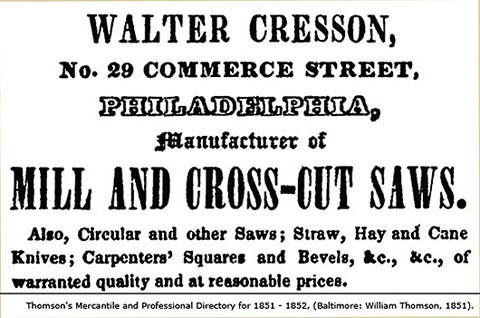 Another advertisement for Cresson’s saws was placed by Cresson, Fisher & Co. in The Boston Daily Atlas in 1848. Sometime during 1849 Walter and William decided to move again. In 1850 we find their “business office” at 29 Commerce Street. About this time they also begun transition of their mercantile business into sale of hardware and tools. 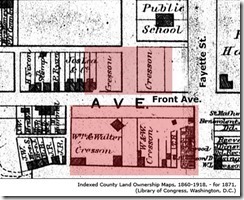 The 1850 U.S. Federal Census, Second Ward-Spring Garden, Philadelphia County, Pennsylvania. took place in July, 1850. 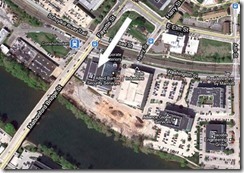 Cresson’s new “business office” location at 29 Commerce Street is shown on the map. It was quite close to the first shop of Henry Disston. 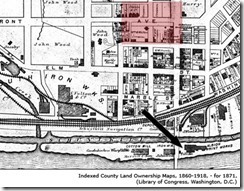 We know that Henry Disston moved to his new location on Laurel and Front Streets in 1846. In 1857 Disston “… brought suit for patent infringement on Sylvester’s behalf (Patentee of the steel recycling process in England) before the Circuit Court of the United States. Sylvester remained in England throughout the two-year court battle, which Disston aggressively pursued. Pennsylvania Supreme Court, Volume 91, p. 168. 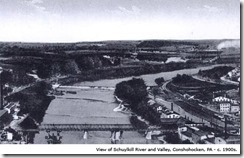 The most important event in the early development of Conshohocken was the building of the Schuylkill Canal. It begun at Philadelphia in 1816, and canal reached Conshohocken, located on the east bank of the Schuylkill River, thirteen miles northwest of Philadelphia, in 1818. 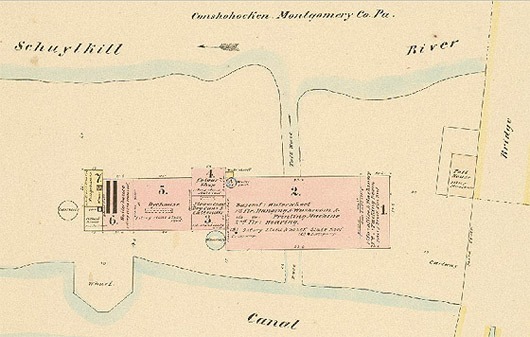 It provided a transportation route along the Schuylkill River and brought the waterpower, which spurred the development of the first mills in the area. The images below show former factory of Walter Cresson. After selling the business to Disston in 1865, the saw factory was converted to a silk mill and was owned by the Conshohocken Silk Works. The plant was managed by Jonas Eberhard, Superintendent. In 1866 the E. Hexamer Insurance Surveyor produced a survey of the plant for fire insurance purposes. 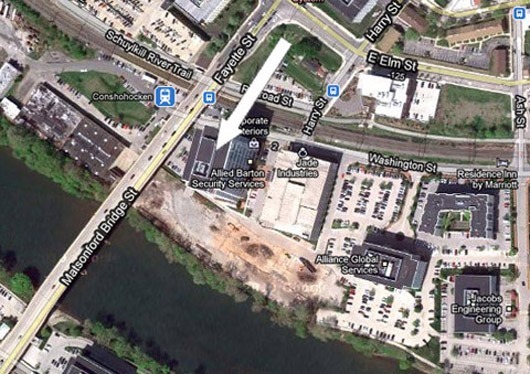 The plant was located between Schuylkill River and Schuylkill canal. I am assuming that general construction of the plant was the same at the time of survey as it was during Cresson’s occupancy. The largest building (No.2) was a 3 story construction in stone and brick with slate roof. A waterwheel installed in the basement was a main power source for the machinery. A front office was located in building No.1. 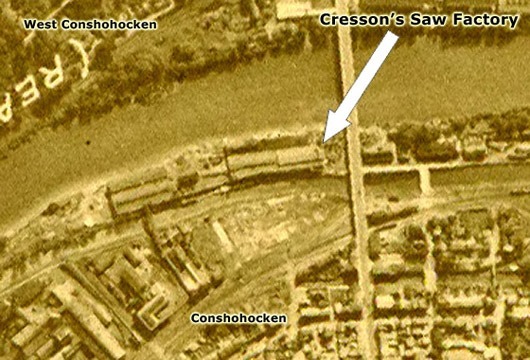 This aerial photograph from c. 1928 shows Cresson’s saw factory location in relation to the Schuylkill River, Schuylkill canal and Matson’s Ford Bridge. This photograph, taken from West Conshohocken toward Matson’s Ford Bridge, c.1920s, shows the former saw factory location. Satellite view of the same location in 2011. The inventory and variety of saws increased and other tools are offered. Various utility knives are now available as well as carpenter’s squares and bevels. 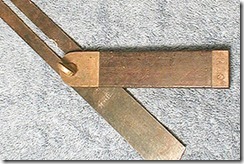 Sliding T-Bevel made in Walter Cresson’s factory. 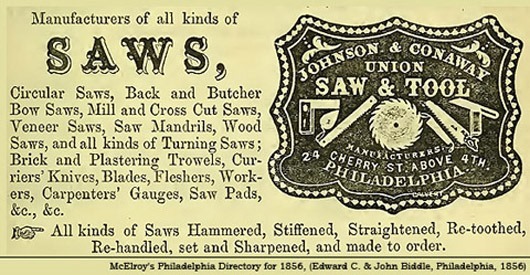 From another rare advertisement published in the “Philadelphia as It Is In 1852: A Current Guide” by R. A. Smith we can learn some more about Cresson’s location, tools he made and pricing strategy. The inventory now is expanded and offers greater variety of tools. 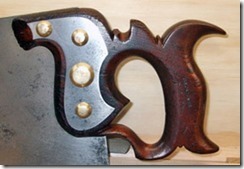 Cresson offers circular saws, veneering saws, coopers’ saws, butcher saws, and wood saws. Other tools included plastering trowels, brick trowels, carpenters’ squares, and various types of knives. The statement “At lowest prices” shows one of the elements of their marketing strategy. One interesting point about saws. Cresson advertising includes Mill, Cross-cut, Pit saws, Circular saws, Veneering saws, Coopers’ saws, Wood saws (buck saws). Other small size saws in the inventory are Butcher saws. Since there are no surviving catalogs of Cresson’s tools (to my knowledge), the advertisements are the only representation of production inventory we can rely on. In a few advertisements we have seen so far, hand saws do not appear. My overall impression is that in the early years (late 1840s and early 1850s) Cresson did not make many of the tools he was offering for sale and most of them were made by other, anonymous, small toolmaking shops. First, there is no indication that Cresson had any training or experience in saw or other tool making. His business tradition was to resale, not to make products. Second, it is indicative that there is no mention of a facility where he could make these tools. In the above advertising Cresson offers ten different types of tools and any of them needed not only specialized skills, but also distinct tooling and material to manufacture. 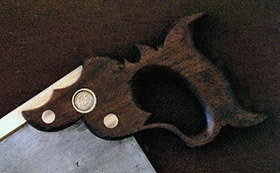 Tool making, including hand saws became possible after his Conshohocken plant was in full operation and adequate staff was onboard. There was also another factor that Cresson had to consider as he was getting his business off the ground. 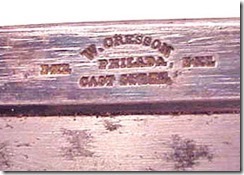 By late 1840s and early 1850s Cresson had several other saw and tool makers to compete with. Here are just a few, listed in the 1848 Philadelphia Almanac and 1854 directory. William Rowland already had strong position and benefit of a long standing company. 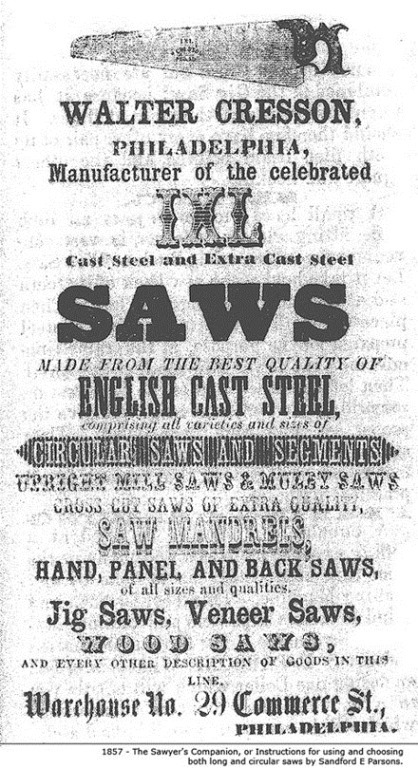 My separate research on William Rowland (currently in final stages) shows that his saws were always in great demand and short advertisements in the newspapers around the country generated quick sale. 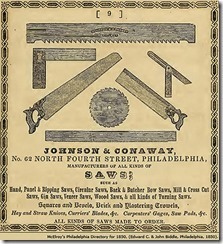 Here is an example of Rowland’s listing from 1823 Commercial Directory of Philadelphia and a typical dealer’s advertisement for Rowland’s saws, published in 1848 in the Bangor Daily Whig and Courier. Below is an advertisement placed by Johnson and Conaway in 1850 McElroy’s Philadelphia City Directory. After closing the shop in 1840, Charles Johnson worked for a while by himself. In 1846 he joined William Conaway and they established new company – Johnson & Conaway. It is understandable that in order to produce good tools and successfully compete with others, Cresson needed the best workers he could find. One of Cresson’s employees was William McNiece, future saw manufacturer. McNiece spent some years as an apprentice to Josiah Bakewell in New York and moved to Philadelphia around 1852. He spent considerable time as Cresson’s employee – from 1852 until 1863. This relation was long and must have been rewarding to Cresson in many ways. 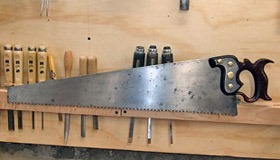 McNiece learned sawmaking in New York from Josiah Bakewell (future partner in Monhagen Saw Works, Middletown, NY) and as future showed, was a talented sawmaker. (8) Some of the saws, shown on the following pages, made in Cresson’s shop can be easily mistaken for saws that came from McNiece’s line years later. McNiece appeared to be a loyal and dedicated employee. Not only he spent over ten years as Cresson employee, but also contributed for wealth of the company in other ways. His first patent, Patent No 23,531 dated 04/05/1859 – Combined Saw, Square and Bevel, is assigned to Walter Cresson of Conshohocken, PA. This further documents his relation with Cresson. Since McNiece was employed by Walter Cresson, it was quite common, however not mandatory, to assign patent received by employee to the employer. During 1853 – 1857 Cresson brothers continued business in the office on 29 Commerce Street and the factory in Conshohocken. In the directory for 1854 the listing for William Cresson changed slightly. The abbreviation for merchant, a “mer.”, previously present in all listings, was dropped this time. 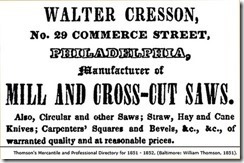 In addition, the Business Directory section listed Walter Cresson in the Saw Manufacturers section for the first time. “The factory of Mr. Cresson was destroyed by fire on August 17th, 1854, but was rebuild on enlarged scale. The energy of the proprietor was peculiarly illustrated on that occasion, for even while the fire was still burning, he rented an old foundry, fitting it up, and on the next day set his men to work in it. In three months the new factory was completed, and in full operation. The whole of the machinery of this establishment is driven by water obtained from the Schuylkill Canal, and applied by one of Journal’s Turbine Wheels. The material employed is mostly cast-steel, manufactured in England expressly for Mr. Cresson, and rolled under his orders to proper thickness, and cut into sheets of convenient size. 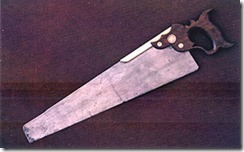 For making Circular Saws, Mill Saws, and Cross-cut Saws, it is imported trimmed to the size and shape required. This description is worth a few comments. First, it lacks an objectivity expected from a historian. He devoted more space in the book to Cresson’s business then to the business of Henry Disston. It is rather surprising, since in his own words, Disston’s business was much larger. The fact is that Cresson’s shop was small and not even close to the scale of Keystone Saw Works. 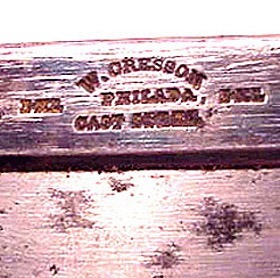 Second, the statement about saw plates being manufactured to Cresson’s instructions and “expressly for Mr. Cresson” in England seem to be an exaggeration and sounds like a marketing slogan. However, since Cresson’s business records are not available at this time, we can’t completely disregard this possibility. In fact, purchasing of the saw plates made in England was rather routine process and most of sawmakers not only had an access to English supply, but in 1840s and 1850s this was the only source for high quality crucible steel. 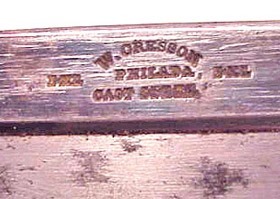 Even Disston, after starting his own experiments with crucible still production in 1855, continued to use Sheffield steel for high end saws and other tools well into the 1880s and 1890s. Greaves & Sons, Agency, 2 Ranstead pl. Greaves & Sons, Agency, 2 Ranstead pl. It is likely that one of these firms was a supplier for Cresson. With all the good about Cresson operation and products, it was tempting to find out who was making these saws and tools. Walter Cresson was not a sawmaker and had no training in the craft. He was a businessman and merchant, who needed reliable team of producers to make his business work. The answer was in the 1860 U.S. Federal Census for the Town of Conshohocken. Walter was a business owner and the company carried his name. His Real Estate Value was approximately $1,000,000 in today’s dollars. According to Walter, William was a business partner and provided limited support functions in business operation. 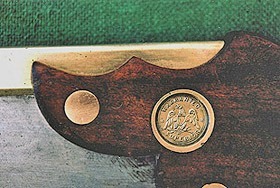 William McNiece was a head sawmaker. He was supported by his brother, Thomas McNiece, who was a saw grinder. There was another saw grinder from England, William Hugo. 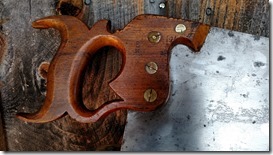 The crew had also a dedicated saw handle maker, Geoffrey Frederick and a saw polisher Lewis Markz. Both of them emigrated from Germany. Presumably, there were a few apprentices, serving as a general shop help. William McNiece was most likely responsible for final quality of product. He joined Cresson’s crew in 1852 and by now he was probably at a peak of his performance. His hand saws were highly praised and he was well aware of it. His self confidence was most likely high at this point of his career and he was getting ready for a major change. Having McNiece in charge of production, Walter Cresson continued with promotion of the business. His name always appeared in business listing of city directories, along with Disston, Rowland and other well known names. 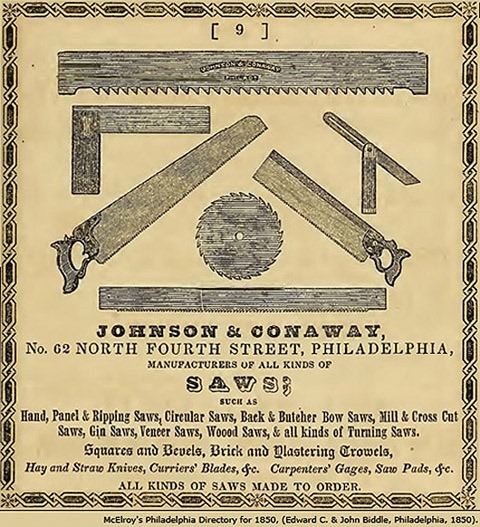 In 1857 he invested in targeted advertisement in a booklet “The Sawyer’s Companion, or Instructions for Using and Choosing both Long and Circular Saws” by Sandford E Parsons. The booklet was specifically designed for sawyers, undoubtedly huge user population of all types of saws. Image courtesy of Carl Bopp. 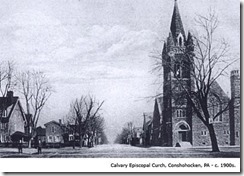 Sometime between 1850 and 1860 brothers purchased residential property and made Conshohocken their home. 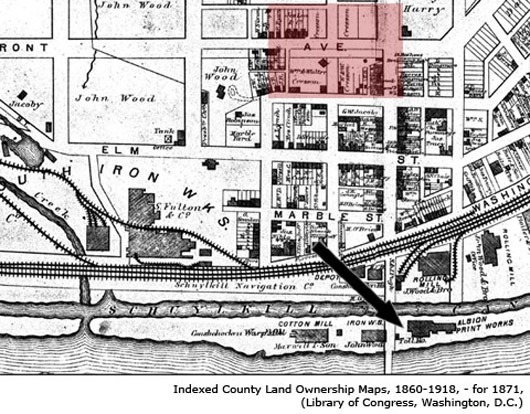 The location of the property is shown on the maps from 1871. 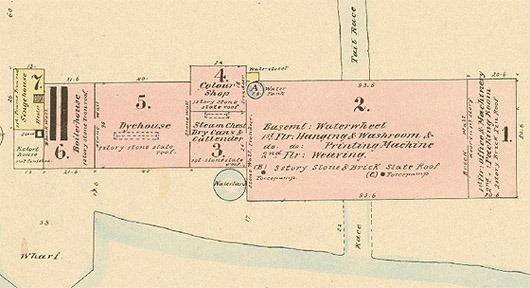 The relation of the residential property to the former saw factory is shown on the map above. 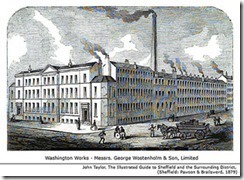 By 1871 the saw factory buildings were housing second tenant – Albion Print Works. The 1860 Federal Census for the Town of Conshohocken shows Walter’s family living in Conshohocken. There were five children in the family but the oldest son, John Head Cresson born in 1845 died two years later. The youngest child was also a son, Walter Cresson, but he died three month after birth. The remaining three daughters lived with their parents. 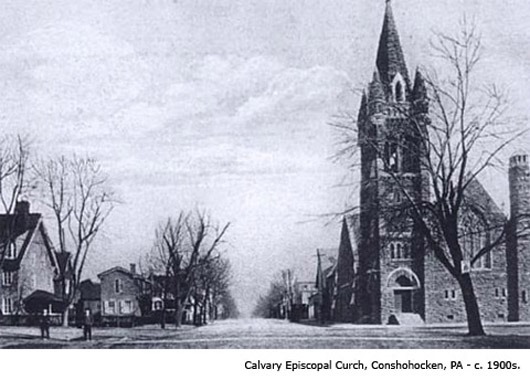 The Calvary Church, Conshohocken, built during Cresson’s tenure as Senior Warden. The 1858 was a year of more changes for Walter and William Cresson. They moved their sales office again and directory shows them at 503 Commerce Street. At the end of the year Walter participated in the Twenty-Sixth Exhibition of American Manufactures, held by the Franklin Institute and received prestigious First Class Premium for his products. He was in good company – Henry Disston and Cheney & Leroy were also among the presenters and recipients of awards for their saws and saw tools. Other well known tool makers showing their products in the same category were John Beatty & Co., Chester County, PA – Edge Tools, Darling & Schwartz, Bangor, Maine – Rules, Squares, and Machinists’ Tools, and J. R. Brown & Sharp, Providence, R. I. – Machinist’s Tools. 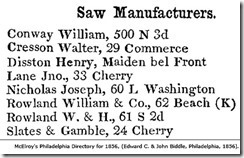 The 1859 McElroy’s Philadelphia Directory lists both brothers in general section and Walter is listed in Business Directory section among other saw manufacturers. 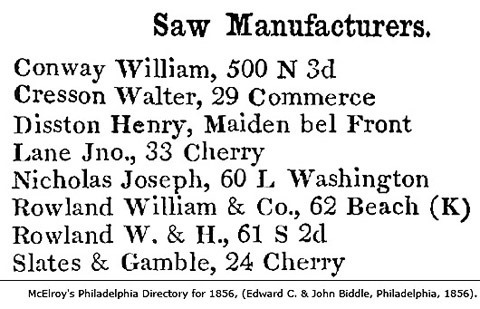 One year later, in 1860, general section lists Walter only and his occupation shows him as a saw manufacturer. The listing also indicates that Walter’s home was in Conshohocken. It is not clear what occurred to bring this change. It is possible that Walter simply decided to consolidate his business under his name only. Another factor could be the fact that by now both brothers settled in Conshohocken for good and William spent most of the time at the factory while Walter was managing the business at the store in Philadelphia. During the court case “Cresson’s Appeal” in 1879 Walter indicated that William was not very efficient and dedicated worker due to his blindness and majority of responsibilities was carried out by Walter. Regardless the reasons, it is obvious that Walter consolidated the business under his name only. The decade of the 1850s was coming to an end and Cresson could close it in the plus column. He transitioned his business into a new field and achieved moderate success. 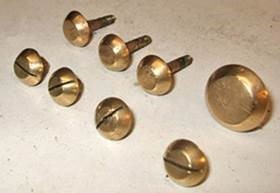 He was a well recognized saw maker and received national award for his products. The sawmaking community as a whole witnessed many changes as well. The directories of late 1850s and early 1860s were bursting with a new names and some known names were disappearing. 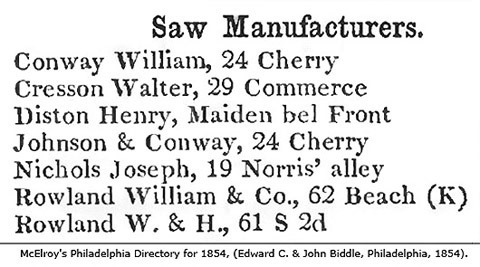 The McElroy’s Philadelphia Directory for 1860 shows 114 residents involved in the sawmaking business. 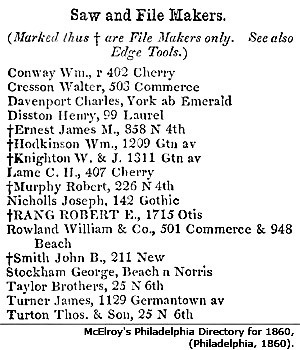 In 1844 the Philadelphia directory listed 20 sawmakers. That’s almost 600% growth in 15 years. The industry had undergone significant structural changes as well. New, stronger manufacturing businesses like Rowland & Co. and Disston’s Keystone Saw Works were assuming leadership roles and many smaller operators, like Cresson and Taylor Brothers, were staking their own space in the market place. Some individual sawmakers organized new partnerships, old partnerships were falling apart, and new, one-man shops started sawmaking ventures. Another symptom of growth can also be seen in the directory listings. Those involved in saw manufacturing assumed clear roles or occupations: saw manufacturers, sawmakers and saw repairers, saw grinders, saw polishers, saw handle makers, and saw sharpeners – something rarely seen 15 years ago. The industry state was also reflected in advertizing and promotion. Businesess begun heavy advertising in directories, magazines and newspapers. Before mid 1850s only sporadic advertisements appeared from William Rowland, William & Charles Johnson, Jonathan Paul, Walter Cresson, Johnson & Conaway, and a few others. In the late 1850s and early 1860s promotion campaigns seem to intensify, last longer and offered richer visual material. 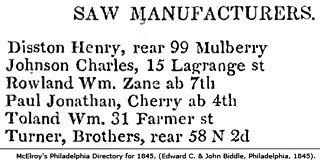 Here is an example of an advertisement placed in the Philadelphia City Directory by William Conaway – Union Saw Works in 1856 and Wm. Rowland & Co., in 1862. 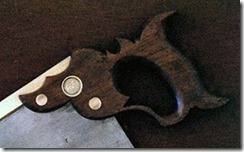 Half-back saw with two-cove apple handle. 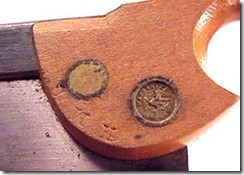 Cresson saws became known for their IXL mark. We don’t have any proof if it was registered trade mark, but it is treated as such. It stands for “I Excel”. 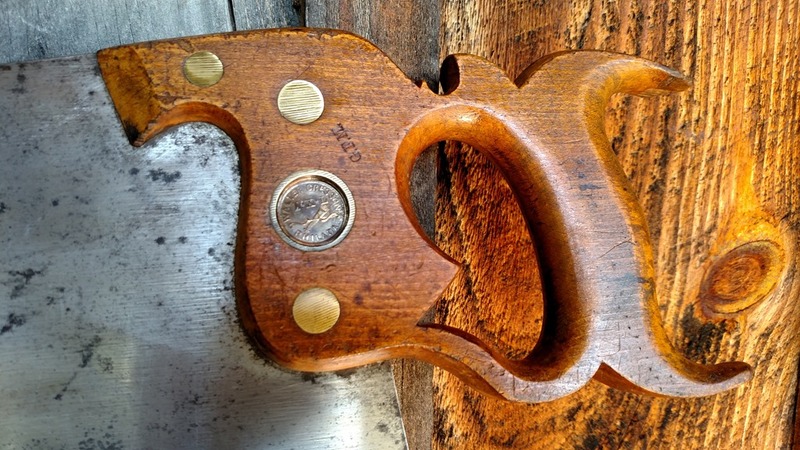 Cresson saws are rather rare and very desirable by tool collectors. As I was finalizing my research on Walter Cresson, another interesting bit of information stopped me in my tracks. “The largest establishment for the manufacture of spring knives is that of Messrs. George Wostenholm and Son Limited, whose cutlery takes the highest rank in the United States of America. 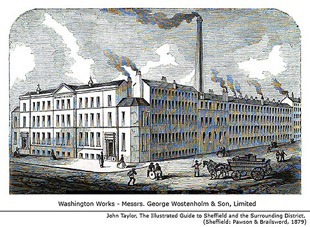 Their commodious premises are appropriately named ‘Washington Works’ – the business of the firm having been formerly almost exclusively American. 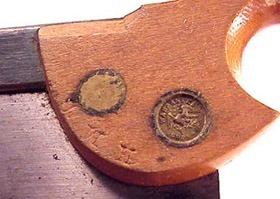 Although the marks are not identical, they are unquestionably suggest that many tool makers of early years used similar trade marks to capture a smidgen of fame from some well established and sometimes famous tool makers. This subject, however, will have to have its own time and a chapter in the annals of Walter Cresson. During 1861, 1862 and most of 1863 Cresson’s business appears to function just as in the years before. However, big changes were looming on the horizon. It is impossible to deduce if Walter Cresson anticipated it or not and how much lead time he had to prepare himself for, most likely, the biggest turmoil in his business. At the end of 1863 William McNiece left Cresson to start his partnership with Charles Lame, another Philadelphia sawmaker. The partnership document shows that McNiece started new venture in November, 1863. Being the important asset in Cresson’s business, he became a competitor almost overnight. Further events in Cresson’s business suggest that this was a fundamental loss, from which Cresson never recovered. In 1865 he sold the business to Henry Disston. The departure of William McNiece however could not have been the only reason for selling the business. Other events most likely influenced Walter’s decision. The country was going through monumental changes by the end of 1865 and the Civil War had an impact on the economy that could not be underestimated. Additional research is needed to understand Cresson’s business performance before and during the war. Another factor could be that Disston, who was on the path of buying out his competitors since the late 1850s, made an offer that Cresson could not refuse. 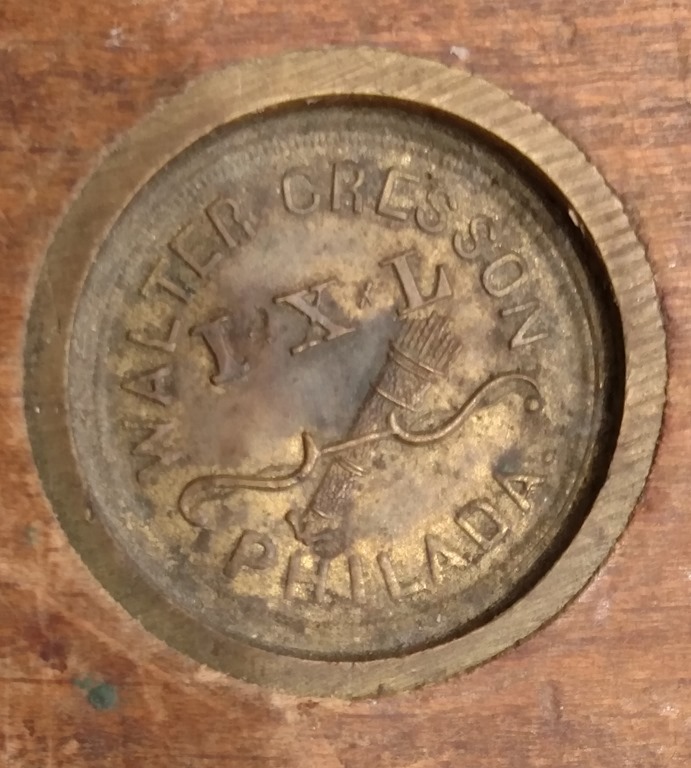 · Walter Cresson Philada – in circle around medallion with I.X.L. and bow/quiver figure in center. 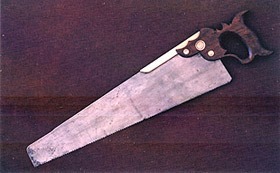 Tool Types: Saws. 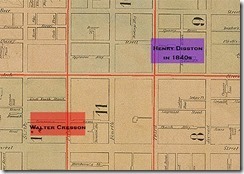 Cresson’s business was bought by Disston in 1862. A W. Cresson saw attributed to William might have been by Walter; the relationship of the two, if any, is not known. 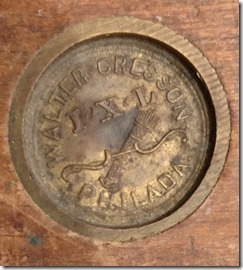 After selling the saw business Walter and William Cresson were involved in a jewelry merchandising business from 1867 to 1875. William Cresson died in Conshohocken, Pennsylvania on February 24, 1874. The 1870 U.S. Federal Census, Conshohocken Borough Subdivision No. 268, Philadelphia County, State of Pennsylvania, took place in August, 1870. Walter Cresson, once a merchant, who turned to saw manufacturing for a time and finally returning to being a merchant, died at his home in Germantown on March 29, 1893. In September, 2011 this article was published in The Chronicle, the quarterly of the Early American Industries Association, Inc. It can be downloaded here. 1. Wilson, Norris, Pennsylvania State Reports-Cases Adjudged in the Supreme Court of Pennsylvania, (Philadelphia, 1881), Vol. 91, pp. 168-182. The most detailed description of relation between William and Walter. Also, provides details of the saw business operation and sale to Henry Disston. Available for download. 2. Oberholtzer, Ellis Paxson, Philadelphia, A History of the City and its People; A Record of 225 Years, Vol. 4, (Philadelphia; 1912), p. 414. The Cresson family of Philadelphia is descended from Pierre Cresson, a French Huguenot, born in 1609 or 1610. The ancient family seat, it is believed, was Menil la Cresson (Cresson Manor), near Abbeville, Picardy. Pierre Cresson, fleeing from his native country at the time of the Reformation, took refuge in Holland, where he remained in exile about eighteen years – in Sluis, Delft, Leyden and Ryswick. During the early part of this period he acted as gardener to the Prince of Orange, thereby earning the soubriquet of Pierre le Gardinier, by which title he was in after life sometimes designated. He married Rachel Cloos or Claes, and they, in 1657, with their children, emigrated to America, settling first at New Amstel, on the Delaware river. But afterward going to Harlem, he was there one of the first magistrates, and took an active part in affairs. He removed to Staten Island in 1678, where he probably died, our last record of him being on August 3, 1681. His widow survived him some years. They were members of the Dutch Reformed church. Of the children of Pierre and Rachel Cresson, Suzanne married, in 1658, at New York, Nicolas de la Plaine, from whom are descended the family of that name in this country. 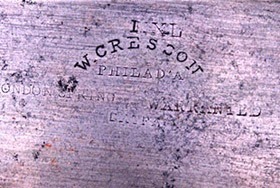 To the oldest son, Jacques Cresson, belongs the distinction of being ancestor of the Philadelphia branch of the family. 3. Jordan, John W., Colonial Families of Philadelphia, (New York, 1911), Vol.2, pp. 952, 954. 4. Franklin Institute, Report for the Sixteenth Exhibition of American Manufactures, held in the city of Philadelphia, from the 20th to the 31st of October, inclusive, 1846, by the Franklin Institute of the Stale of Pennsylvania, for the promotion of the Mechanic Arts, (Philadelphia, 1846) p. 400. 5. Jordan, John W., Colonial Families of Philadelphia, (New York, 1911), Vol.2, pp. 952, 954. 6. Silcox, Harry C., A Place to Live and Work: The Henry Disston Saw Works and the Tacony Community of Philadelphia, (Philadelphia, 1994), p. 3. 7. Egle, William H., An Illustrated History of the Commonwealth of Pennsylvania, (Harrisburg, 1876), p.958. 9. Tweedale, Geoffrey, Tweedale’s Directory of Sheffield Cutlery Manufacturers 1740 – 2010, (Tweedale, 2010). 10. Journal of the Proceedings of the Seventy-Sixth Convention of the Protestant Episcopal Church in the Diocese of Pennsylvania for May, 1860, (Philadelphia, 1860). 11. 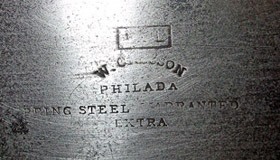 Freedley, Edwin T., Philadelphia and its Manufactures in 1857, (Philadelphia, 1858), p. 329. 13. Apprentices’ Library Co. of Philadelphia Annual Reports for 1835-1880, (Philadelphia, 1880). 14. Cooper, William, A History of the Plymouth and Whitemarsh Turnpike Company, (Conshohocken, 1923). 15. Journal of the Proceedings of the Seventy-Sixth Convention of the Protestant Episcopal Church in the Diocese of Pennsylvania for May, 1860, (Philadelphia, 1860). 16. Hobson, Buck, and Dotterer, The Centennial Celebration of Montgomery County, (Norristown, 1884). 17. Tweedale, Geoffrey, Tweedale’s Directory of Sheffield Cutlery Manufacturers 1740 – 2010, (Tweedale, 2010). 18. 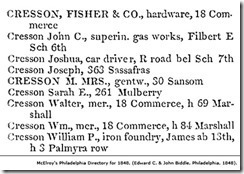 Disston, Henry & Sons, Saw, Tool, Steel and File Works – Price-List, July 1906, (Philadelphia, 1906), p. 2. Bishop, J. Leander, A History of American Manufactures from 1608 to 1860, (Philadelphia and London, 1864), Vol.2, pp. 509, 574. Bolles, Albert S., Industrial History of the United States (Norwich, Conn., 1879), p. 275. Buck, William Joseph, History of Montgomery County within the Schuylkill Valley (Norristown, 1859), p.77. Clark, Victor Selden, History of Manufactures in the United States 1607–1860, (Washington, D.C., 1916), p. 522. 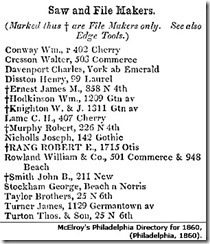 Disston, Henry & Sons, Saw, Tool, Steel and File Works – Price-List, July 1906, (Philadelphia, 1906), p. 2. Disston, Henry & Sons, Disston Handbook on Saws, (Philadelphia, 1912), p. 5. Egle, William H., An Illustrated History of the Commonwealth of Pennsylvania, (Harrisburg, 1876), p.958. Franklin Institute, Report for the Sixteenth Exhibition of American Manufactures, held in the city of Philadelphia, from the 20th to the 31st of October, inclusive, 1846, by the Franklin Institute of the Stale of Pennsylvania, for the promotion of the Mechanic Arts, (Philadelphia, 1846) p. 400. Franklin Institute, Report of the Twenty-Sixth Exhibition of American Manufactures held in the City of Philadelphia from October 15 to November 13, 1858 by the Franklin Institute of the State of Pennsylvania for the Promotion of the Mechanic Art, (Philadelphia, 1858) p. 58. Freedley, Edwin T., Philadelphia and its Manufactures in 1857, (Philadelphia, 1858), p. 329. Historical Publishing Company, Pennsylvania Historical Review, Gazetteer, Post-office, Express, and Telegraph Guide. City of Philadelphia – Leading Merchants and Manufacturers, (New York, Philadelphia and Chicago, 1886). Jordan, John W., Colonial Families of Philadelphia, (New York, 1911), Vol.2, pp. 952, 954. Oberholtzer, Ellis Paxson, Philadelphia, A History of the City and its People; A Record of 225 Years, Vol. 4, (Philadelphia; 1912), p. 414. Parsons, Sandford E., The Sawyer’s Companion, or Instructions for using and choosing both long and circular saws, (Philadelphia, 1857). Scharf, J. Thomas and Westcott, Thompson, History of Philadelphia, 1609-1884, (Philadelphia, 1884), Vol. 3, p. 2267. Silcox, Harry C., A Place to Live and Work: The Henry Disston Saw Works and the Tacony Community of Philadelphia, (Philadelphia, 1994), p. 3. Simmons, Edward E., “The Hardware Trade”, in Depew, Chauncey M., One Hundred Years of American Commerce, (New York, 1895), Vol. 2, p. 636. Smith, R. A., Philadelphia As It Is In 1852: A Current Guide, (Philadelphia, 1852), p. 216. Tweedale, Geoffrey, Tweedale’s Directory of Sheffield Cutlery Manufacturers 1740 – 2010, (Tweedale, 2010). Wilson, Norris, Pennsylvania State Reports-Cases Adjudged in the Supreme Court of Pennsylvania, (Philadelphia, 1881), Vol. 91, p. 168. 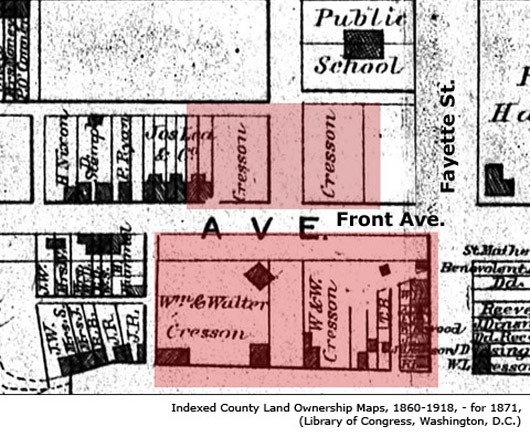 1850 U.S. Federal Census, Second Ward-Spring Garden, Philadelphia County, Pennsylvania, July, 1850. 1860 U.S. Federal Census, Town of Conshohocken, Montgomery County, Pennsylvania, June, 1860. 1870 U.S. Federal Census, Conshohocken Borough Subdivision No. 268, Montgomery County, Pennsylvania, August, 1870. Apprentices’ Library Co. of Philadelphia Annual Reports for 1835-1880, (Philadelphia, 1880). Cooper, William, A History of the Plymouth and Whitemarsh Turnpike Company, (Conshohocken, 1923). Journal of the Proceedings of the Seventy-Sixth Convention of the Protestant Episcopal Church in the Diocese of Pennsylvania for May, 1860, (Philadelphia, 1860). Index of Executive Documents – The Senate of the United States, First Session, Thirty-Third Congress, 1853 – 1854, (Washington, 1854). Hobson, Buck, and Dotterer, The Centennial Celebration of Montgomery County, (Norristown, 1884). Report of the Philadelphia Relief Committee Appointed to Collect Funds for the Sufferers by Yellow Fever at Norfolk & Portsmouth, VA. of 1855. (Philadelphia, 1856). 1837 – M‘Elroy’s Philadelphia Directory for 1837, (Philadelphia, 1837). 1839 – M‘Elroy’s Philadelphia Directory for 1839, (Philadelphia, 1839). 1840 – M‘Elroy’s Philadelphia Directory for 1840, (Philadelphia, 1840). 1841 – M‘Elroy’s Philadelphia Directory for 1841, (Philadelphia, 1841). 1842 – M‘Elroy’s Philadelphia Directory for 1842, (Philadelphia, 1842). 1843 – M‘Elroy’s Philadelphia Directory for 1843, (Philadelphia, 1843). 1844 – McElroy’s Philadelphia Directory for 1844, (Philadelphia, 1844). 1845 – McElroy’s Philadelphia Directory for 1845, (Philadelphia, 1845). 1846 – McElroy’s Philadelphia Directory for 1846, (Philadelphia, 1846). 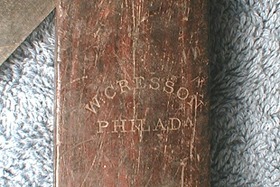 1847 – McElroy’s Philadelphia Directory for 1847, (Philadelphia, 1847). 1848 – McElroy’s Philadelphia Directory for 1848, (Philadelphia, 1848). 1848 – The Philadelphia Almanac And General Business Dir. for 1848, (Philadelphia, 1848). 1848 – The Boston Daily Atlas, (Boston, 03/31/1848). 1849 – McElroy’s Philadelphia Directory for 1849, (Philadelphia, 1849). 1850 – McElroy’s Philadelphia Directory for 1850, (Philadelphia, 1850). 1851 – McElroy’s Philadelphia Directory for 1851, (Philadelphia, 1851). 1851 – Thomson’s Mercantile and Professional Directory, 1851-52, (Baltimore, 1851). 1852 – McElroy’s Philadelphia Directory for 1852, (Philadelphia, 1852). 1853 – McElroy’s Philadelphia Directory for 1853, (Philadelphia, 1853). 1854 – McElroy’s Philadelphia Directory for 1854, (Philadelphia, 1854). 1855 – McElroy’s Philadelphia Directory for 1855, (Philadelphia, 1855). 1856 – McElroy’s Philadelphia Directory for 1856, (Philadelphia, 1856). 1857 – McElroy’s Philadelphia Directory for 1857, (Philadelphia, 1857).